A group of scientists have greatly improved the capacity and performance of lithium ion batteries based on the Nobel Prize-winning concept called "mechanical bond," the Korea Advanced Institute of Science and Technology said Friday. 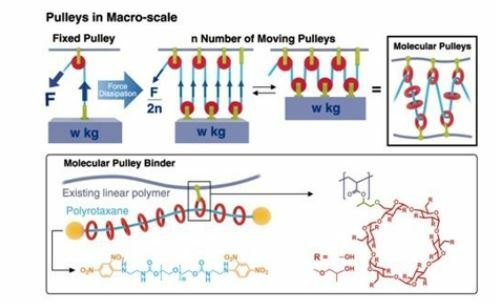 The team led by Choi Jang-wook and Ali Coskun integrated molecular pulleys, called polyrotaxanes, into the battery -- a breakthrough in battery technology -- South Korea's top engineering and technology university said. In 2016, Fraser Stoddart of Northwestern University won the Nobel Prize in chemistry for mechanical bond, which is a newly identified concept, and can be added to classical chemical bonds in chemistry. Silicon anodes are receiving a great deal of attention from the battery community, as they can deliver up to five times higher capacities compared with those using current graphite anodes in lithium ion batteries. A higher capacity means longer battery use per charge, which is particularly critical in extending the driving mileage of all-electric vehicles. "The long fundamental study is now expanding in an unexpected direction that addresses longstanding challenges in battery technology," the researchers said, adding that they are currently in collaboration with a major battery maker to get their molecular pulleys integrated into real battery products.